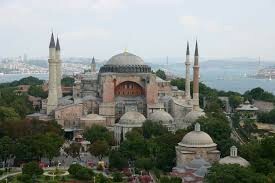 The Basilica of Hagia Sophia was constructed by Roman Emperor Justinian in 537 AD. This was the largest church in the Christian world for a thousand years.Its immense dome rises nearly 200 feet above the ground and its diameter spans more than 100 feet. The mosaics covering the walls are among the most important works of art that have survived to this day of the Byzantine era. Large round buildings had been successfully covered by domes before, but Hagia Sophia had a rectangular floor plan, and covering a large rectangular structure by a huge central dome was being tried for the first time in history. The dome collapsed and repaired many times. 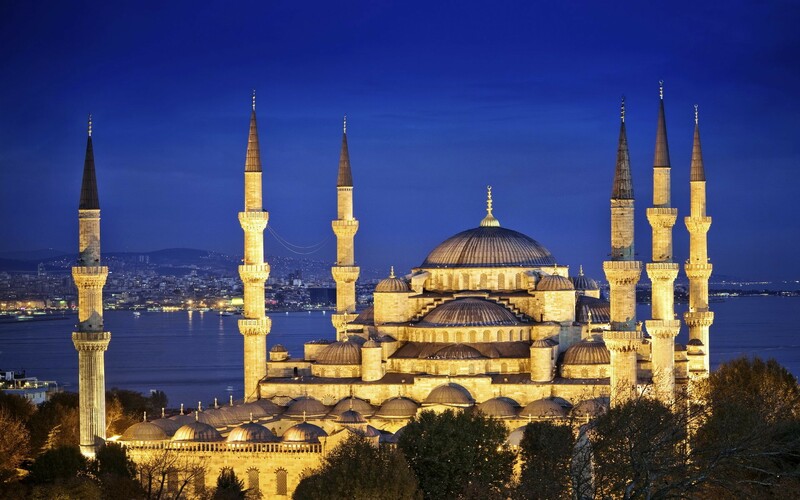 Sultanahmet Mosque is the most famous monument in both the Turkish and the Islamic worlds. It was built in the classic Turkish architectural style between 1609-1616 by the architect Mehmet. The building is more familiarly known as the Blue Mosque because of its magnificent interior paneling of more than 20,000 blue and white Iznik tiles.The inside is a single immense space into which the light pours from 260 windows. The dome 141 feet high, is supported by four enormous circular pillars 16 feet in diameter and are known as elephant feet. As it is located across Hagia Sophia, the mosque was designed to be as large and as magnificent as this Byzantine structure. 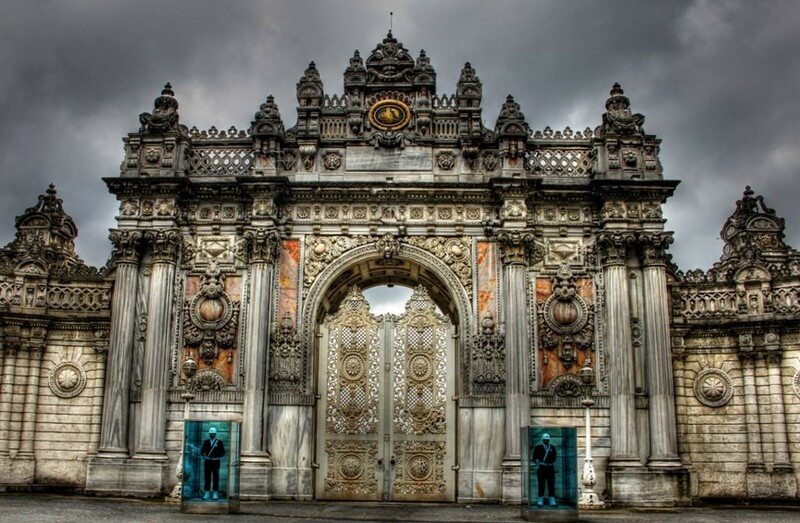 Topkapi Palace is certainly the most important historical site to be visited in Istanbul. 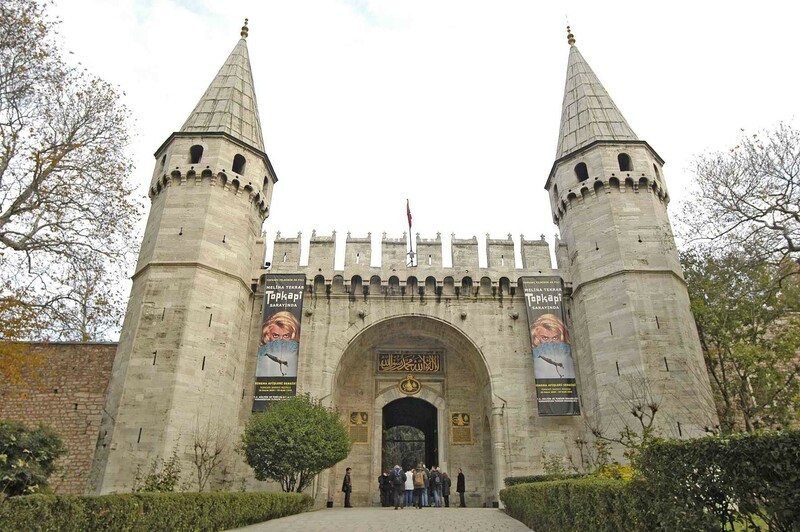 It is one of the most frequently visited museums of Europe and is the most visited one in Turkey. The Palace served as the administrative center of the Ottoman Empire for nearly 400 years between the 15th and 19th centuries. Its principal parts were finished in 1478, then altered and enlarged by new additions in the reign of each succeeding sultan. The Palace was abandoned in 1855 when Sultan Abdulmecit I, 31st Sultan of the Ottoman Empire, moved to the new Palace of Dolmabahce. In 1924, it was turned into a museum upon the orders of Ataturk.Palace is a complex of buildings spread out over one of the seven hills of Istanbul. It consists of courtyards serving different purposes which are separated from each other by monumental gates. Pavilions, each used for different purpose, surround these courtyards. The total area of the Palace is twice the area of Vatican and half of Monaco in size.Besides being the official residence of the Sultan, the Topkapi Palace served as the headquarters of the government. It also housed the state treasury and the archives. The mint, as well as the highest educational institution were located on the Palace grounds. Dolmabahce Palace, built in the mid-19th century by Sultan Abdulmecit 1, stretches for 600 meters along the European shore of the Bosphorus. The palace has survived intact with its original decorations, furniture, silk carpets, curtains and everything else. It is said that 14 tons of gold and 40 tons of silver were used for the decoration of the palace.The palace contains 285 rooms, 43 salons and six baths. Its walls and ceilings are covered with paintings by the famous artists of that age. Rare handmade art objects from Europe and the Far East decorate every room in the palace. The ballroom is the largest of its kind in the world. A 4.5 ton giant-sized crystal chandelier with 750 bulbs hangs from the 120 feet high dome. The floors are parquet, of exceptional quality and are laid with high-quality silk carpets, hand-woven in the Imperial Factory of Hereke.Ataturk used to stay in this palace when he visited Istanbul. He died here in 1938. All the clocks in the palace were stopped at 9:05 am, the time of his death, in memory of this great Turk.The Palace which is a museum today is open on certain days of the week, and it is one of those historic places in Istanbul that must be visited. 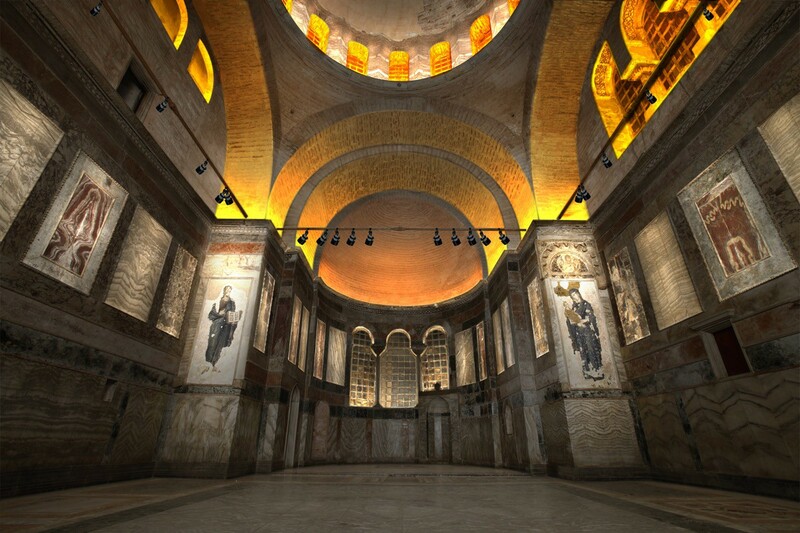 The Kariye Museum is, after Hagia Sophia, the most important Byzantine monument in Istanbul. The existing building was built towards the end of the 11th century and dedicated to Christ the Savior.After the Turkish conquest, the church remained deserted for a time, and was turned into a mosque in 1511 by addition of a minaret. It became a museum in 1948 and its frescoes were cleaned and restored by the American Institute of Byzantine Research.The walls are decorated with superb 14th century mosaics, illustrating scenes from the life of Christ and the Virgin Mary. These are the finest masterpieces of Christian religious art to be found anywhere in the world. Paintings, rocks and architectural designs seen in the background make the pictures three-dimensional. The scenes are made with special care for them to look daily, lively and ordinary. The scenes are enriched with explicating stories near them. 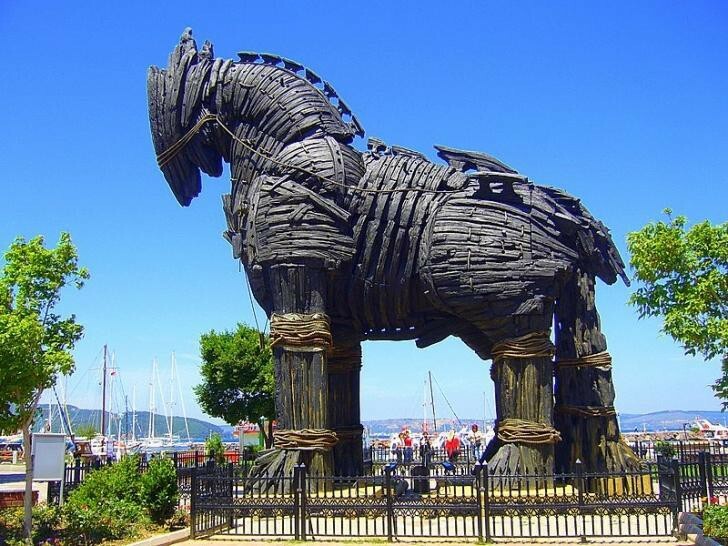 Ancient city of Troy is located 30 km south west of Canakkale province in the Marmara Region of Turkey. 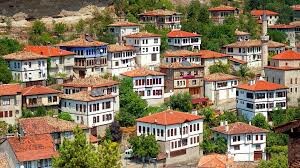 This is one of the most important historical cities of Anatolia. Archeological excavations have revealed nine separate periods of settlement at this site, including ruins of city walls, house foundations, a temple and a theater. The earliest settlement dates from five thousand years ago and the last coincided with the late Roman period. Famous Trojan wars, depicted in Homer's epic Iliad took place here at about 1200 BC. A symbolic wooden horse at this site commemorates this legendary war. 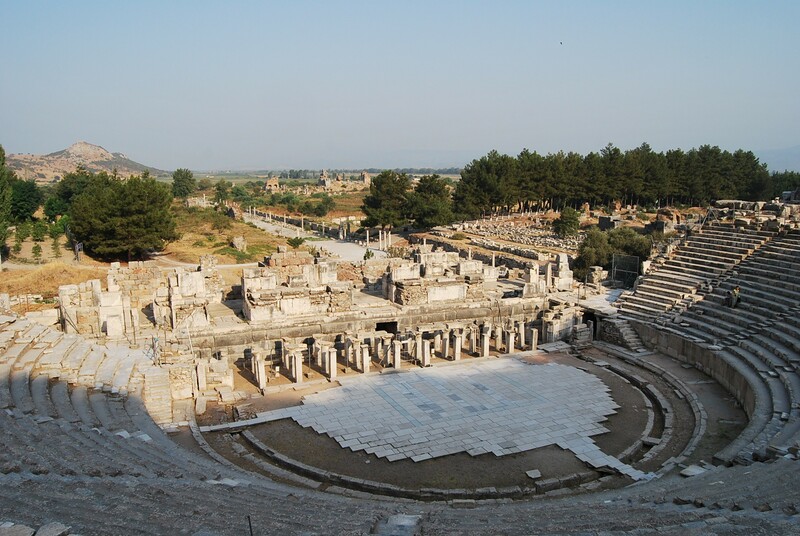 The ruins of Ephesus is one of the world's greatest archaeological sites. 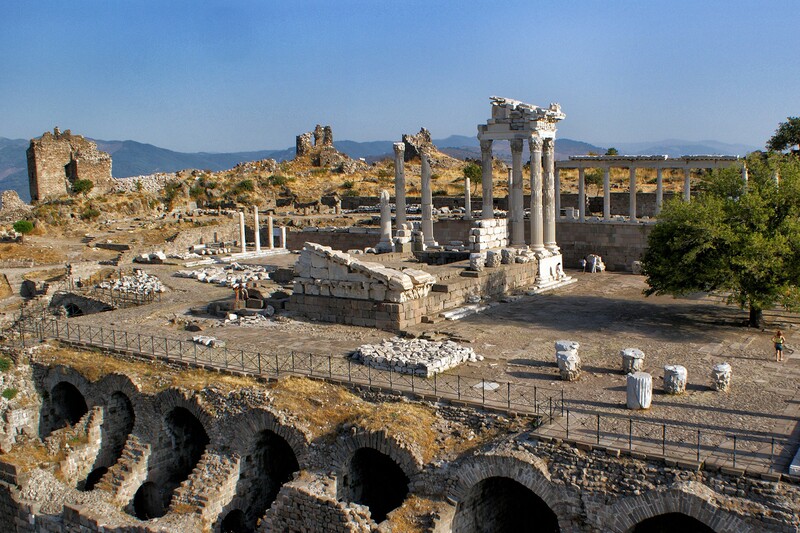 It is located 75 km south of Izmir.In Hellenistic times, Ephesus became the most densely populated city in Anatolia with a population of more than 200 000. The city reached the peak of its glory under the Roman rule and became a very important centre of trade and commerce. A majority of the monuments that exist now date to that period. It was also the leading political and intellectual centre, with the second school of philosophy in the Aegean. The Temple of Artemis at Ephesus was one of the seven wonders of the ancient world. Ephesus also emerged as one of the main centers of early Christianity. St. Paul remained in the city for three years during his third missionary journey (53-57).The Apostle John also came to Ephesus to live and was finally buried here. Ephesus was one of the Seven Churches mentioned in his book of Revelation.Tradition has it that St.John brought Virgin Mary to Ephesus after Christ's crucifixion and that she lived and died in a small wooden house located about three miles away in the forested mountain above Ephesus at the age of 101. In the year 431 the Third Ecumenical Council was held in the Basilica of the Virgin Mary in Ephesus. In the following century, Emperor Justinian(527-565) built a massive church at the spot where St John was believed to have been buried. It became an important site of pilgrimage throughout the Middle Ages. The city ruins include the agora, theater, gymnasium, stadium, Church of the Virgin Mary, Temple of Serapis, Temple of Hadrian, Fountain of Trajan, Scholasticia Baths, Temple of Domitian and terrace houses that once belonged to rich Ephesians, as well as the Celsus Library. The Cathedral of St. John is on the Ayasuluk hill above the city. The Celsus Library (shown in the picture) is the most impressive building of them all. According to inscriptions in Latin and Greek on the wings of the front steps, the Library was erected in AD 110 by the Consul G.J.Aquila for his father, G.J.Celsus Polemaeanus, formerly Roman Consul and governor of the Asian province.The library was completed in AD 135 by his heirs. Its facade was two-tiered; the interior consisted of a single large hall, measuring 10x16 m, comprising the Celsus library itself. The burial chamber under the floor contains the marble sarcophagus of Celsus in an excellent state of preservation. The reading room destroyed in a fire in the second half of the 3rd century, but the facade did not suffer damage. For a time, the library was left filled with the resulting debris. About AD 400, the area in front of the building was converted into a pool. The facade served a decorative purpose, with its beautiful silhouette mirrored in the water. The monumental facade as it stands today is the result of restoration work begun in the 1970s, completed and the whole opened to the public in 1978. The impressive remains of this once-splendid city are situated on a high plateau, within Aydin Province. 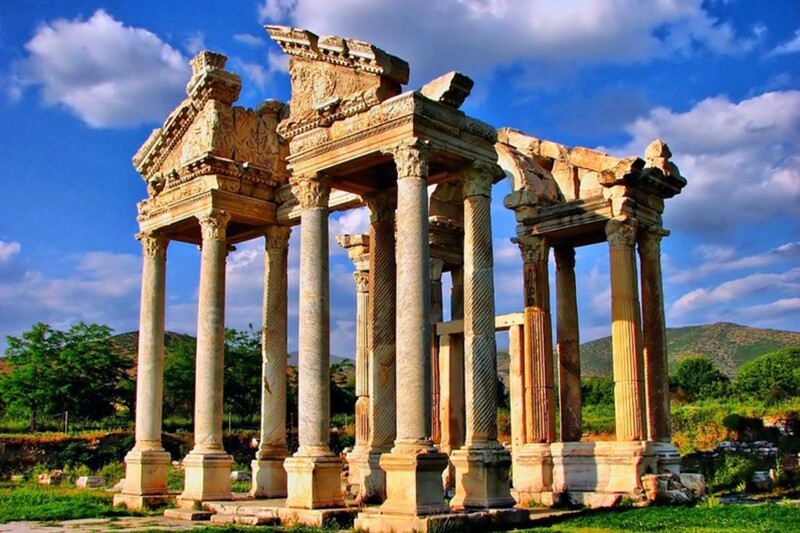 As its name suggests, Aphrodisias was named after Aphrodite, a goddess of nature, love and fertility and was the site of one of her most famous sanctuaries.Although the history of Aphrodisias stretches farther back in time, it rose to prominence in the first century BC and enjoyed a long period of prosperity. Besides being a significant religious site, it was also a cultural and intellectul center to which students and scholars flocked from all over the ancient Hellenistic world. With an excellent marble supply, perhaps the finest available anywhere, the city became the center of a school of sculpture that flourished for a period of six hundred years.Many of its marvelous works of art are now housed in the local museum.The Temple of Aphrodite was the focal point of the city in antiquity, as it still is today with its fourteen standing columns. The stadium, located in the northern end of the city, is probably the best preserved structure of this type in the Mediterranean. It could accommodate as many as 30,000 people. The theater, odeon (concert-hall), Bishop's Palace, Baths of Hadrian are among other ruins. East of the temple, one of the most attractive landmarks of Aphrodisias is a decorative gateway (in the picture) datable to the middle of the second century. It consisted of four rows of four columns and its main access was from the east, with a front row of spirally-fluted Corinthian columns facing a main north-south street.Its sixteen columns have been repaired and re-erected and upper portions partly replaced. Pergamon (or Pergamum), once a great center of culture, survives as one of Turkey's finest archeological sites. It is located 100 km north of Izmir.The city experienced its golden age until the end of the 3rd century AD during Hellenistic and Roman times. In the Acropolis, above the modern town, are the remains of the library, a steep and impressive theatre, the temples of Trajan and Dionysos, the monumental Altar of Zeus, the sanctuary of Demeter, a gymnasium and the Agora. The Asclepion, located to the southwest of the lower city, was a medical center dedicated to the god of health, Asclepios. Patients were treated with water and mud baths, with massages and with medicinal herbs. The center also had a small theather, a library, a sacred fountain, temples as well as two meeting rooms and lavatories for women and for men. The site of Pergamon was first excavated by the German archaeologists between 1878 and 1886. It was during this time that the magnificient reliefs of the Altar of Zeus were discovered and carried to Berlin and now displayed in Berlin Museum. Ancient authors tell us that the Pergamon library at one time contained 200 000 volumes. Mark Anthony carted them off to Egypt as a gift for Cleopatra, to replace the ones that had been lost when the Alexandrian library was burned during Caesar's campaign. In the middle of the library's main reading room is the podium on which there stood at one time the 3.5 meter high statue of Athena that is now in the Berlin Museum. 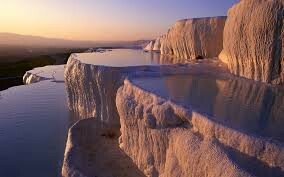 The ancient region of Cappadocia lies in Central Anatolia between the cities of Nevsehir, Kayseri and Nigde. Three million years ago, violent eruptions of the nearby volcanoes covered the surrounding plateau with a deep layer of solidified mud, ash and lava. The winds, rivers and rains have eroded this soft volcanic rock into hundreds of strangely shaped pillars, cones and fairy chimneys, creating a vast outdoor museum of stone sculptures in an incredible variety of shapes, layering, textures and colors.Since the most ancient of times, men have been carving dwellings in this soft rock; the early Christians made countless cave churches, chapels and monasteries. There are more than 200 churches in Capadocia scattered through the valleys, with their impressive frescoes and art works.The most amazing speciality of Cappadocia is the underground cities which are still being discovered. The ones in Kaymakli and in Derinkuyu are the most famous ones. These cities with 8-9 floors underground have been completely carved in volcanic tuff and were used by Christians as places to retreat to and live in until danger from their enemies had passed. The narrow tunnels which could be blocked by millstones at times of escape, the ventilation systems, and the hidden rooms of these cities show a perfect planning and construction. But the absence of inscriptions and decorations of any kind makes it difficult for the art historians to determine the dates of construction. The horses and the stud farms of Cappadocia have been famous throughout history. 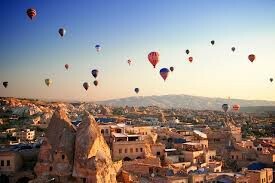 The word Cappadocia comes from the word "Catpaducia" meaning "the land of beautiful horses". Founder of the Mevlevi Order known in the West as the Whirling Dervishes, Muhammed Celaleddin lived in Konya from 1228 until his death in 1273. 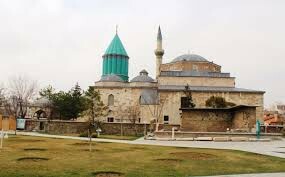 He was given the name Mevlana (Our High Master) by his followers.The nearly 6500 m2 land, on which the convent lies, used to be a rose garden belonging to Seljuk Sultan Alaaddin Keykubat. He gave the area to Mevlana's father, Bahaddin Veled. as a gift. Bahaddin Veled was buried here in accordance with his will. From that day on, this place became a popular visiting spot. The building of the tomb began in 1274, only after the burial of Mevlana beside his father. In 1396, the tomb was covered by a cone shaped dome decorated by exquisite turquiose tiles.The building has gone through many modifications during different periods in history and it has turned into a collection of buildings, an institution. In 1926, the Mevlana Convent opened as a museum. The artifacts presented to the convent throughout the centuries are on display. The most interesting section of the museum is under the green dome where the sarcophagi of Mevlana and his son, Sultan Veled, stand. The museum contains 65 sarcophagi of the members of Mevlana's family and his followers. On display are hand-written copiess of the sayings and books about Mevlana and Mevlevi order, musical instruments, metal glass and wooden objects, carpets and kilims. In the former dervish cells, the garments of the order are exhibited. Antiochos I, ruler of the Commagene Kingdom in the first century BC, built himself this funeral monument on top of Mount Nemrut in eastern Turkey. It consists of a tumulus and a dozen gigantic statues representing Antiochus I, eagles, lions and ancient gods. Lion and eagle statues were used as the guardians. The tumulus is 50 m high and 150 m. in diameter. Although the inscriptions at the back of the thrones on east and west terraces record that Antiochos I had chosen the hierothesion as his sacred last resting place or a place where his body will sleep for endless eternity, sysmic research did not show any grave chamber or large cavity in the tumulus. The average height of the statues is 26-33 feet. These are made of stone, too heavy and large to be carried to the muesum and remain where they were originally erected. Time has inflicted heavy damage on the sculptures- their bodies sit with their beautifully carved heads at their feet. This province in southeast Turkey is known as the "city of Prophets", because the Prophets Job, Abraham and Suayb, whose names are mentioned in the holy books and who lived before the emergence of the three monotheistic religions- Judaism, Christianity and Islam - resided here. According to Muslim tradition, Prophet Abraham was born in a cave on the northern side of Sanli Urfa castle. 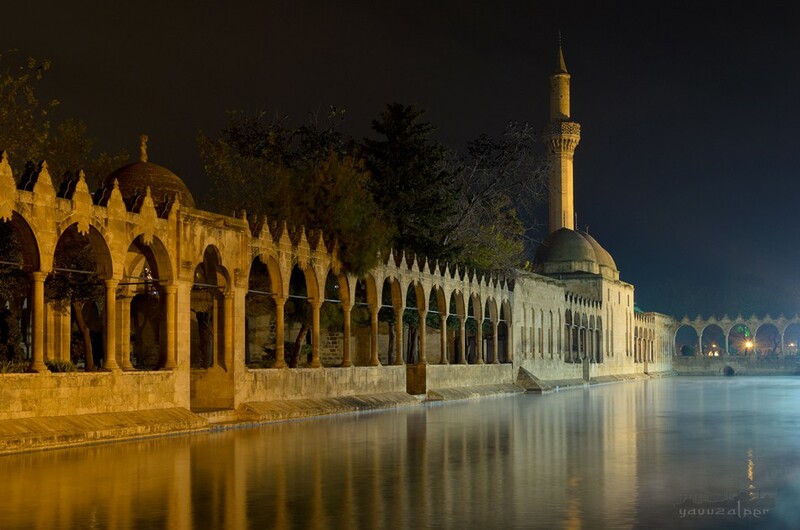 Today the cave is a pilgrimage site.There is a fish lake in the center of Sanli Urfa filled with sacred fish and surrounded by Halil Rahman Mosque. According to legends, Abraham believed in a single god and tried to spread this belief. For his refusal to follow the worship of idols, Abraham was condemned to be burned.The cruel King Nimrod had Abraham launched from a catapult from the city's citadel to fall into a pile of burning wood. God intervened and turned the fire into water and the wood into fish, which make up water and fish in the pool. ISTANBUL, SAFRANBOLU, MT.NEMRUT, TROY, PAMUKKALE AND CAPPADOCIA ARE REGISTERED ON THE WORLD HERITAGE LIST TO HELP PRESERVE THEM FOR FUTURE GENERATIONS. The Islamic sacred relics were brought to Istanbul after the seizure of the Hejaz, grew in number and were for centuries preserved with great care. Although the Islamic sacred relics were at the beginning, considered as the material remains inherited from the Prophet Muhammad, the first four caliphs and the companions of the Prophet, the contents of these remains expanded to include gifts presented to Muslim holy places. The number of relics originating in the Prophet's time are very few. With the entry of Selim the First into Cairo, as a result of the Egyptian Campaign (1517), the territories belonging to the Mamluks, and those under their control, passed on to the Ottomans. The Emirate of Mecca, under the control of the Mamluks, recognized Ottoman sovereignty. The Hejaz thus fell into the hands of the Ottomans, under the same status as that enjoyed during the Mamluk rule.Known as the "Emir of Mecca", Abu Numey, came to Cairo on the third or fifth of July 1517, accompanied by the notables of Mecca, the Islamic sacred relics and the key to the Kaaba. Selim I sent the Islamic sacred relics, which had been presented to him, to Istanbul. The transfer of the Islamic sacred relics to Istanbul was not limited to the time of Yavuz Sultan Selim (1512-1520). Over the centuries, the number of items categorized as Islamic sacred relics gradually increased; collections were enriched until the collapse of the Ottoman Empire by the addition of new relics brought to Istanbul. Some of the Islamic sacred relics, which had been kept in the Prophet's Tomb, in mosques in different cities, in tombs and in the hands of individuals, were transferred to Istanbul when deemed appropriate. Precious Qur'ans and other valuable objects, which the Ottoman sultans and other leading figures of the Islamic world were presented with as gifts, were also recognized as sacred relics. Among them, the "Hirka-i Saadet" is a black woolen jacket, measuring 124 cm, with wide sleeves and a cream-colored wool lining. An examination by the textile experts of the Topkapi Palace has concluded that this cloth is a product of the Prophet's time. The Hirka-i Saadet was brought to Istanbul after the Mongolian invasion in 1258. The Has Oda, presumably built by Fatih Sultan Mehmed, was allocated for the keeping of Islamic sacred relics by Yavuz Sultan Selim. The most prestigious of the relics being the jacket, this room was called the "Hirka-i Saadet Dairesi". Among other important relics, the following can be found: a piece of the Prophet Muhammad's tooth, broken off during the battle of Uhud; hairs of the Prophet Muhammad's beard; six footprints on stone and brick believed to belong to the Prophet; the black flag of the Prophet Muhammad; the Rod of the Prophet Moses; the Saucepan of the Prophet Abraham carved from a bluish piece of stone; letters sent by the Prophet Muhammad to certain rulers and individuals to invite them to Islam; Qur'anic verses written on leather, presumably by early scribes; an empty broken bottle, green in colour which was believed to be used for washing the body of the Prophet after his death. ; the prayer mat of Hazreti Fatma; the key and locks of the Kaaba; swords which belonged to Prophet David, Prophet Muhammad, the first four caliphs and the companions and disciples of the Prophet. There are also countless Qur'ans in the Hirka-i Saadet Hall. Among them is one written on gazelle leather is considered to correspond to the period of Caliph Osman's rule. The Ottoman Sultans held the sacred relics with great care. The sultans frequently visited the Hirka-i Saadet, particulary on Fridays and holy nights. During military campaigns and on special days, the sultans used to visit the Hirka-i Saadet Hall first, perform the salat and pray here. On accession to the throne, the new sultan would first visit this hall, perform two rakats of salat, pray and accept the oath of allegiance from the functionaries of the royal ward, and then go out to participate in the ceremony. From the 18th century on, these visits, which held a special status within the protocol of the Ottoman state, were regularly paid on the fifteenth day of the month of Ramadan, after the noon prayer. After the abolition of the sultanate on 1 November 1922, both the custom of visiting the Hirka-i Saadet as well as the recitation of the Qur'an in the Hirka-i Saadet Hall day and night came to a halt. When the Topkapi Palace was converted into a museum on 3 April 1924 following the proclamation of the Republic, the Has Oda was closed to the public until 1962, after which date the hall became a tourist sight, devoid of spiritual meaning. Also visit www.kultur.gov.tr, Archeology: Wonders of Turkey section to see the photographs of some important relics.